The Bottom Line: Expect sunshine and unseasonably warm temperatures on Saturday. Anticipate changing snow surface conditions with increasing potential for wet loose avalanches throughout the day. Triggering an avalanche in wind-drifted snow may still be possible in isolated upper elevation terrain. No new avalanches were reported in adjacent zones on Friday. Cloud cover and northwesterly winds kept snow surfaces relatively cool. A breakable crust exists on all aspects to at least 5000ft (higher on southerly aspects). This presented challenging travel conditions the past two days. Evidence from Wednesday’s widespread avalanche cycle is easy to find. 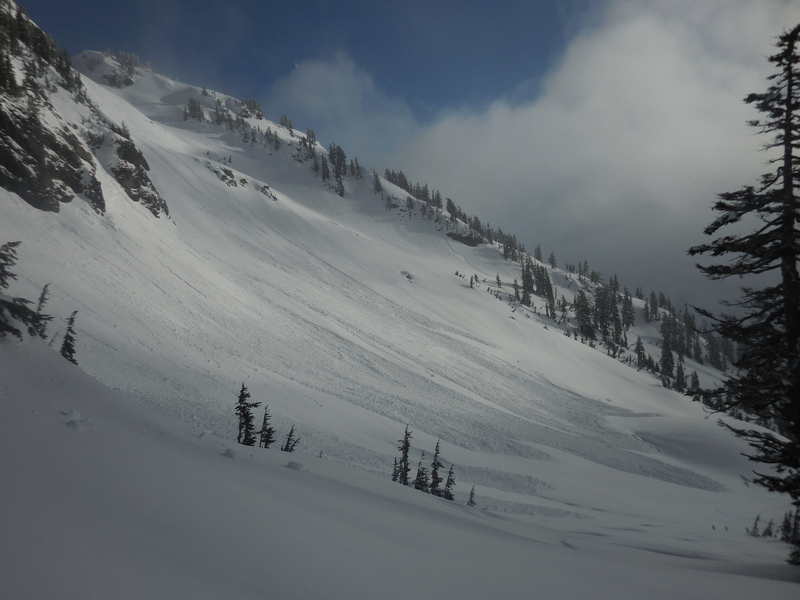 Intense sun may cause another round of wet avalanches. Freezing levels will skyrocket to 11,000ft by Saturday afternoon. Pay attention as the surface crust breaks down throughout the day. If you see rollerballs, pinwheels, or experience wet surface snow deeper than your ankle, loose wet avalanches may follow. If the surface crust remains frozen, avalanche activity will be limited. Be careful around steep, rocky, sun-exposed slopes, especially in the afternoon hours. Even small wet loose avalanches can be harmful in confined or exposed terrain. Winds slabs that formed during the mid-week storm still linger above treeline. Although these slabs have gained strength over the past few days, you may still be able to trigger them in isolated upper elevation areas - on very steep slopes, near convex rollovers, or just below cornices. Encountering the problem will become more likely the higher in elevation you travel. Look for rounded pillows of snow, textured snow surfaces, wind-sculpted features, and hollow sounding snow as signs that wind slabs may exist nearby. Avoid unsupported wind-loaded slopes and terrain features 35 degrees and steeper.